We travel full time with our Tiny House and so far we’ve gone 15,000 miles in eight months. 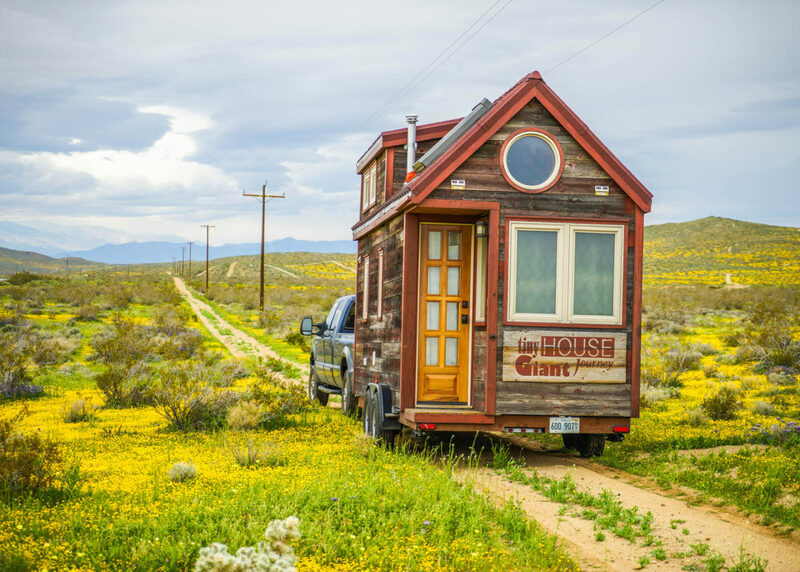 We’ve figured out the logistics on our own, including the cost of towing a tiny house. Below I’ve outlined OUR monthly expenses in hopes that it is helpful for our fellow travel bugs. So, here you go folks, these are the REAL COSTS for towing a tiny house. Our Tiny House weighs 10,100 pounds when fully loaded. We tow with a Ford F-250 Diesel 4×4 and get between 8-10 mpg. We put 2,070 miles per month on our truck. That number includes ALL driving, not just towing. This number is SUPER high! We had to replace a few parts in our truck, including the FICM, the alternator and two batteries. I can’t say whether this is due to towing or not, because the 2006 Ford F-250s are known for these problems. Sigh.. that’s life I guess. Hopefully this number will start to go down. We had a regular 10,000 bearing inspection (they were good). We had to replace our tongue jack because we crashed the Tiny House on our maiden voyage… Full explanation here. We also had to replace our chimney cap a few times due to damage from low tree branches. Our truck is paid off. Yippee! We used to have two cars and a motorcycle in our “pre-tiny” lives. Not having a car payment is a blessing. Our Tiny House is paid off. Yippee! We used to pay $2000 a month in rent in Los Angeles. 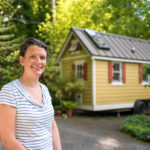 So far we haven’t found a Tiny House Insurance plan that is affordable and available as a multi-state / multi-country plan. 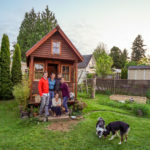 At this point, it’s not affordable for our tiny house to be insured. While we travel down the road, it is covered under our truck insurance as a “tow load.” When we are parked and detached, it gets tricky. Let us know if you have heard of an insurance plan that would work for our situation. We use Verizon wireless as our provider because they have the fastest data service. We’ve been relatively happy with the service, but it’s expensive. Due to our web related jobs, we need at least 30 gigabytes a month. Obviously if you do not need 30 GB (or the internet at all) this number is irrelevant. Campgrounds sometimes have WIFI available, but it’s usually terribly slow. We park in campgrounds on average 8 nights a month. The rest of the time we park on private property, offered by some of the most gracious people in the world (our followers and other Tiny House enthusiasts). That helps A LOT! Campground fees can average between $10 – $60 a night. We are a member of Passport America, which offers a 50% discount on thousands of campgrounds all over North America. We use propane for our cooktop, water heater and sometimes to power our refrigerator. We fill up our water tank in campgrounds or from our parking hosts. So far we haven’t had to pay for water or power (of which we use very little), aside from our campground fees. We carry our trash and dispose of it responsibly in campgrounds. While this number might seem high, it’s less than our old apartment rent payment in Los Angeles (which was $2600 a month not including utilities, car payments, gas, etc)! We could save a lot of money by traveling less and canceling our internet, but that’s not the lifestyle we want. You might notice that we did not include food expenses, phones expenses, health insurance, student loans, etc. That is because those expenses would be the same on or off the road, tiny or big. We hope this is helpful! Could you do it cheaper?